If you’re a woman living with endometriosis, or you suspect you might have it and are scheduled to have surgical treatment, you may be eligible to participate in the ROSE Study. Your immediate family (siblings, parents and children), if they do not have endometriosis, may also be eligible to join the study. ROSE Study researchers are exploring what causes endometriosis and if a better treatment can be developed. 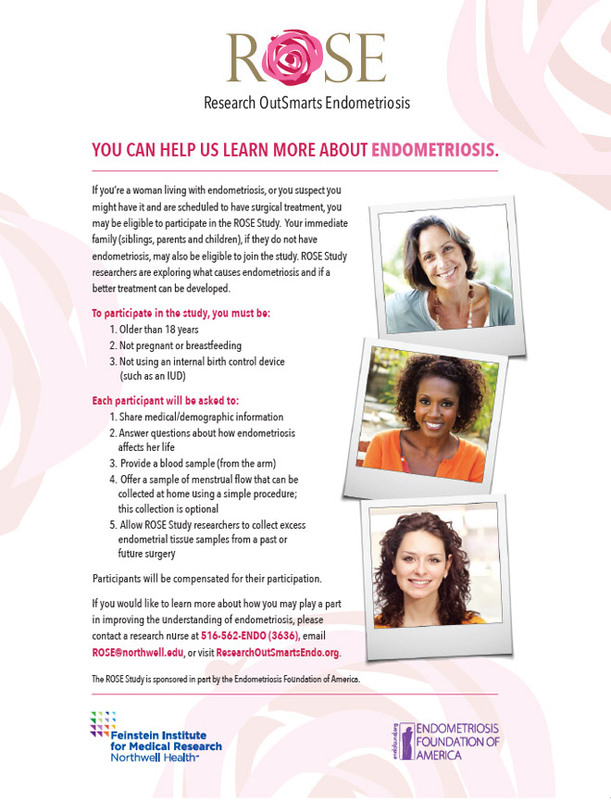 If you would like to learn more about how you may play a part in improving the understanding of endometriosis, please contact a research nurse at 516-562-ENDO (3636) or ROSE@northwell.edu, or visit us at ResearchOutSmartsEndo.org. Disclaimer: The Endofound is a charitable entity and is not committed to matching the indirect cost rates of the U.S. government or other entities. We believe our policy to allow no more than 10% of any Endofound research grant funding to go towards indirect costs is consistent with that of many private foundations and certain government entities that have a flat rate that caps the amount an applicant institution can charge. Endofound's policy helps ensure furtherance of our charitable purpose.